Is there a way to have the fields permanently hidden? Just one more thing. I've hidden the "Municipio" fields in the jotform but if I reload the page they show up again. Is there a way to let them always be hidden? 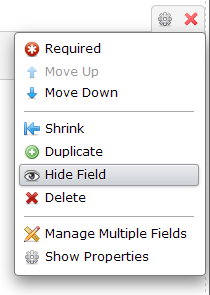 If you right click on the field and select Hide Field in Form Builder, the form field should be always hidden from the form. It is however important to note that if you set up some conditions to show these fields, they will be shown, but if you give us the link to the form and tell us what fields you do not wish to see, we can assist with the CSS code that would make them hidden.